A direct sequel to the 2001's bestselling RPG developed by Piranha Bytes. The sequel continues the story of the original game set in Myrtana, where good and evil forces are constantly fighting each other. 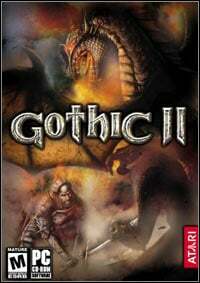 Gothic II for PC is a sequel to one of the best action role-playing games - 2001's Gothic. As previously, the story in Gothic II is set in a fantasy world, and it continues the plot of the original game. Evil forces embodied by a wide set of monsters, orcs and orges, all of them led by dragons, are constantly fighting humans. In this game, the player explores more than just the Valley of the Mines isolated from the rest of the world with a magical barrier. The action takes place in a variety of diverse locations, such as the harbor town, the island of dragons, a castle besieged by orcs, libraries or farms. The players familiar with the original game will have an opportunity to revisit certain areas as well. The gameplay remains almost unchanged. However, adequate improvements were made, for example, the protagonist can now become also a henchman, a dragon hunter or a magician. There are new guilds and abilities the main character has, like brewing potions for example. In Gothic II for PC, the protagonist can develop a set of skills, including a few standard combat techniques (single-handed and two-handed weapons, bow and crossbow) and over a dozen other skills such as sneaking, lock picking, pick pocketing, creating runes, alchemy or smithing. The player can also use more and more powerful spells contained within six magic circles. Artificial Intelligence of characters and monsters was remodeled. For instance, inhabitants of the town will alert guards when attacked, and monsters can help each other to kill the protagonist. The visuals were improved as well - the entire game world and its particular parts such as towns, houses or trees are more detailed now. There are some one hundred face textures in total. Game score 8.75 / 10 calculated out of 21092 players' votes.